Tropic Escape Quilt Bedding by C & F Enterprises - PC Fallon Co.
Lowest prices all the time, guaranteed! If you find a better price, let us know. 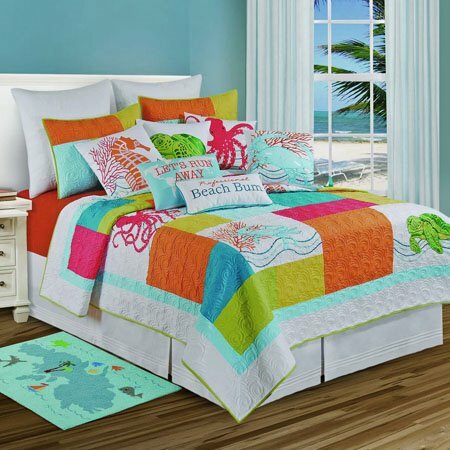 Tropic Escape Quilt bedding by C & F Enterprises is a fun and lively ensemble with bright blocks of color in red, orange, blue, yellow, aqua, and green combined with a seahorse, an octopus, a blue crab, and a sea turtle. The quilt has a white border with green binding trim. The sea creatures from the quilt are also featured on throw pillows. Add to the fun with a beach bum pillow, a run away pillow, and a rug showing your private getaway island. Note that due to the size of the twin quilt, all of the sea creatures will not appear on the twin quilt. Add a throw pillow with your favorite. Bright blocks of color in red, orange, blue, yellow, aqua, and green combine with a seahorse, an octopus, a blue crab, and a sea turtle. White border with green binding trim. Reverses to solid white. Cotton Filled, Prewashed, Luxury Oversized. 66" x 86". We offer the complete ensemble in the Tropic Escape pattern by C & F.
Bright blocks of color in red, orange, blue, yellow, aqua, and green combine with a seahorse, an octopus, a blue crab, and a sea turtle. White border with green binding trim. Reverses to solid white. Cotton Filled, Prewashed, Luxury Oversized. 90" x 92". Fits full and queen size mattresses. We offer the complete ensemble in the Tropic Escape pattern by C & F.
Bright blocks of color in red, orange, blue, yellow, aqua, and green combine with a seahorse, an octopus, a blue crab, and a sea turtle. White border with green binding trim. Reverses to solid white. Cotton Filled, Prewashed, Luxury Oversized. 108" x 92". We offer the complete ensemble in the Tropic Escape pattern by C & F.
Bright blocks of color in orange, yellow, aqua, and green with green binding trim. 20" x 26". We offer the complete ensemble in the Tropic Escape pattern by C & F.
Blue crab with sea reef on white pillow. 18" x 18". We offer the complete ensemble in the Tropic Escape pattern by C & F.
Red octopus on white pillow. 18" x 18". We offer the complete ensemble in the Tropic Escape pattern by C & F.
Orange seahorse with red sea reef and blue waves on white pillow. 18" x 18". We offer the complete ensemble in the Tropic Escape pattern by C & F.